Nick and Todd were tangling for this week’s podcast game, which left me free to challenge our resident Skorne expert (Skornist? Skornologist? ), Kassem! I love playing against Skorne, both because Kassem tends to employ off-the-wall tactics and lists, and because they’re so different from the other Factions! As you can see, I’ve finally managed to get Thyra on the table! As for Kassem, he was happy to put Makeda3 on the table with a list consisting of a battlegroup… and Beast Handlers. 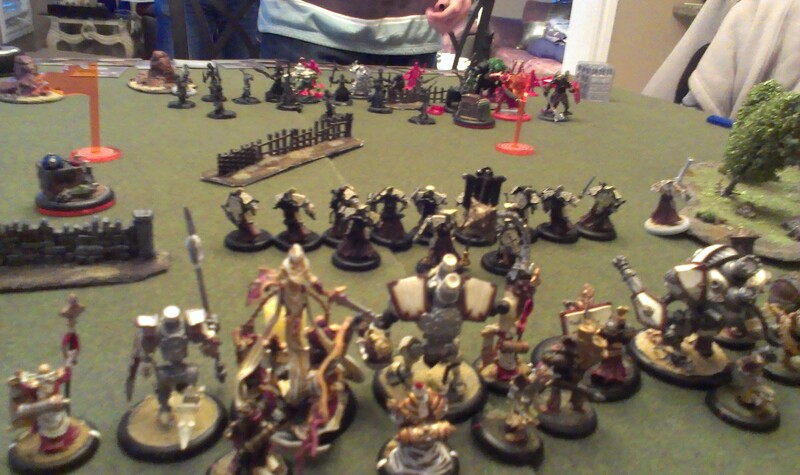 Battle 012 – Menoth vs Skorne, Harbinger vs Makeda3: Menoth Protects! With Nick playing Gaven for this week’s Podcast game (coming out on Monday! ), I was left free to challenge Kassem. Kassem is also planning on attending the same tournament that Aaron, Nick, and I are planning to attend (as well as Adam, I believe! ), so we were both rockin’ lists we wanted to test out for said tournament. Kassem was actually trying to decide between 2 experimental lists for the event… two Skorne warlocks that he had “good feelings” about, but had never tested: Makeda3, and Mordikar. As for me, I’m still pretty unfamiliar with both my lists and warcasters, although I’m certainly getting better. I figured another chance to get more comfortable with the Harbinger was more important than testing out my new eFeora build… which I hopefully will get done during my next games against Ozzie! Besides, taking Errants with Rhupert and a no-knockdown effect… too awesome to pass up!